Today's Motivational Monday post is another long one! I hope everyone has had a great couple of weeks. I obviously had an amazing time in San Diego for Ragnar SoCal, and I was so proud to see my little brother finish his first 5K on Saturday. But I am definitely relieved to get back to my typical eating/running routine. Because this post is so long, I have to truncate it again--so I'm sorry, but if you're reading this on a reader of some sort, you'll have to click through to see the whole thing. Lots of submissions today! 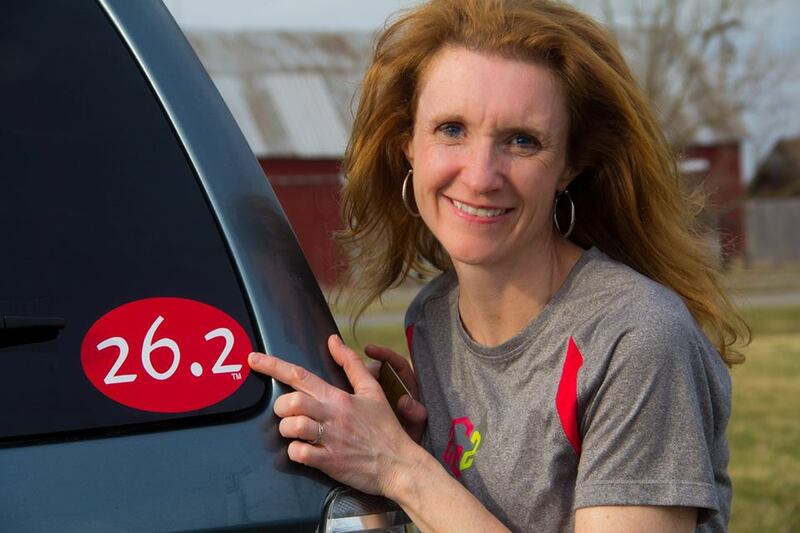 Cindy Jo just completed her longest run yet--7 miles--in preparation for a half-marathon! 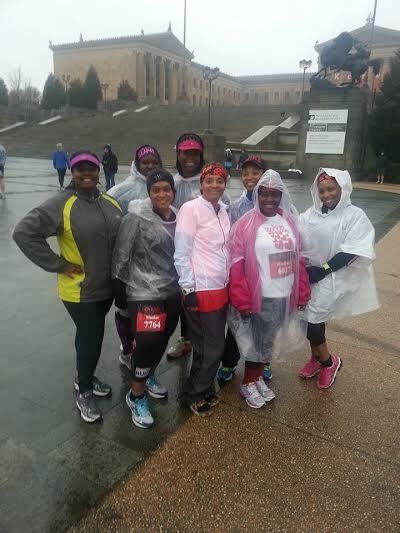 She completed her first 5K last year, and her co-workers suggested doing a half. She said it's a scary goal for her, and sometimes she doubts her ability to do it, but she was SO proud to have accomplished her 7-miler! 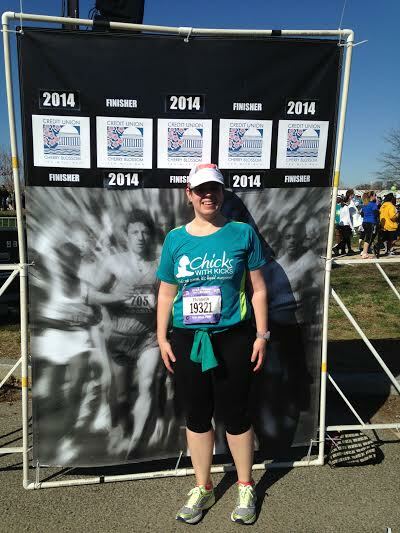 Elizabeth just ran the Cherry Blossom 10-Mile race in Washington D.C.! The race has a strict 2:20 time limit, which worried her during her training. She obviously had nothing to worry about, because she finished in 1:58! There were many times she wanted to walk, but she talked herself into running a little farther... until she'd run the entire race. 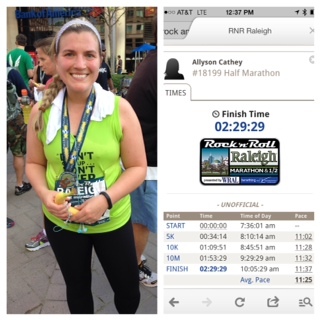 Allyson just completed her first half-marathon! 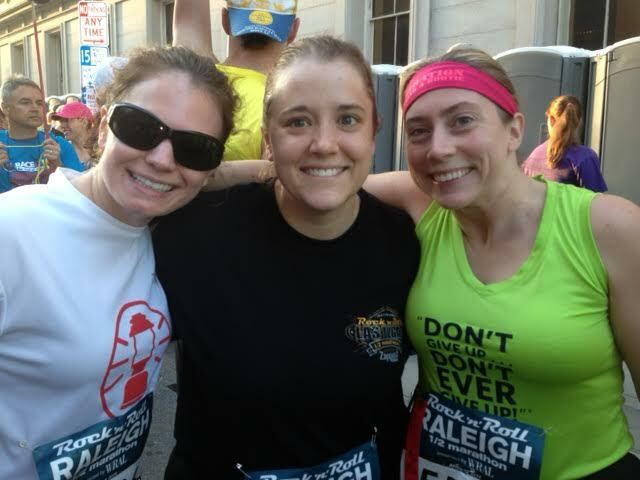 She ran the Rock 'n' Roll Half in Raleigh. It was hilly, and harder than she expected. 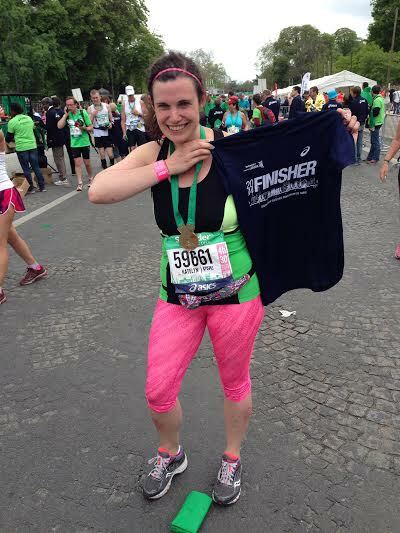 Her goal was to finish sub-2:30, and she crossed the finish line in 2:29:29! 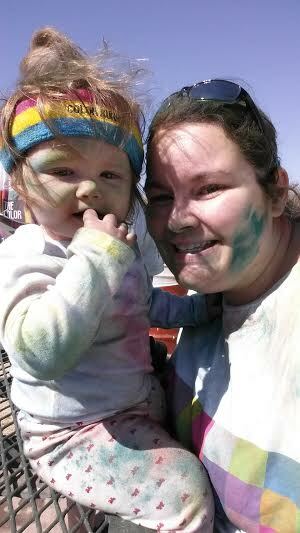 Melissa had a very rough pregnancy, and was put on hospital bed rest due to severe preeclampsia. Not surprisingly, she gained a lot of weight. She read the Motivational Monday posts, and determined that when she got down to her goal weight, she'd be on Motivational Monday... and here she is! 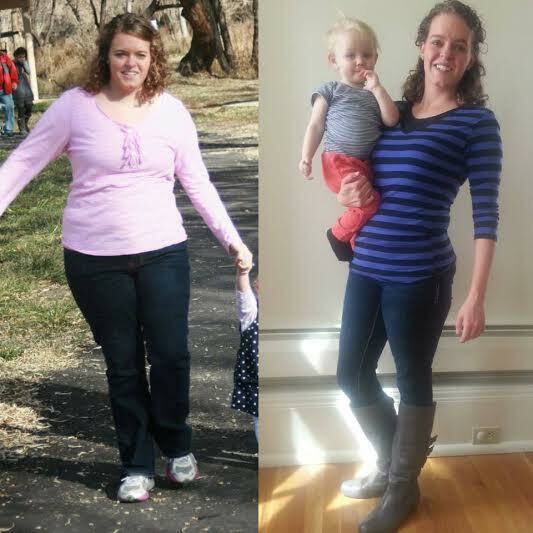 Six months later, through eating well and exercising, she's lost 70 pounds and 10 pants sizes. 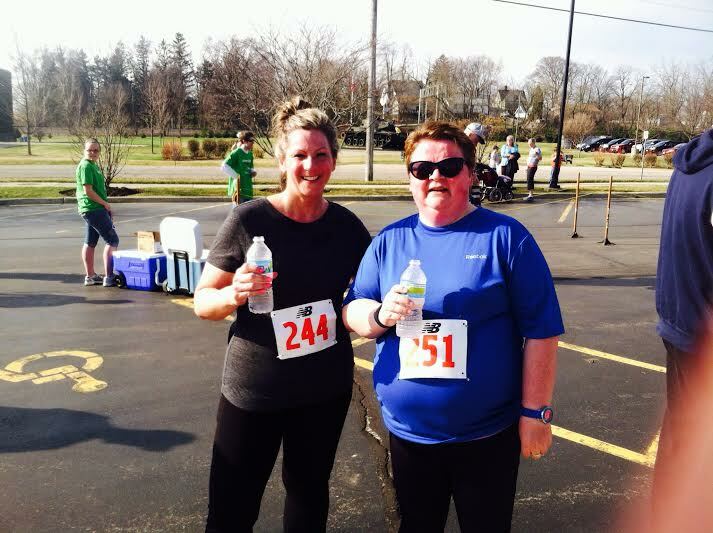 In November, Shelley (in black) joined a workout/weight loss challenge. Even though a quarter of the members dropped out within the first week, she toughed it out and kept going forward. She became friends with Lee (in blue) in the program, and they became workout buddies. 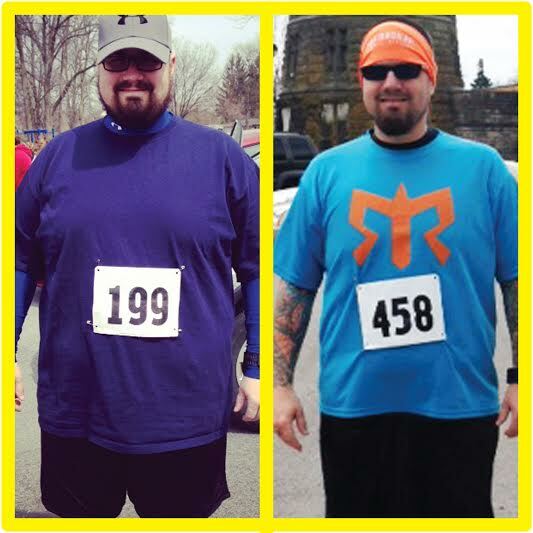 They lost 20 pounds in 40 days, winning their challenge, and continued to push each other. 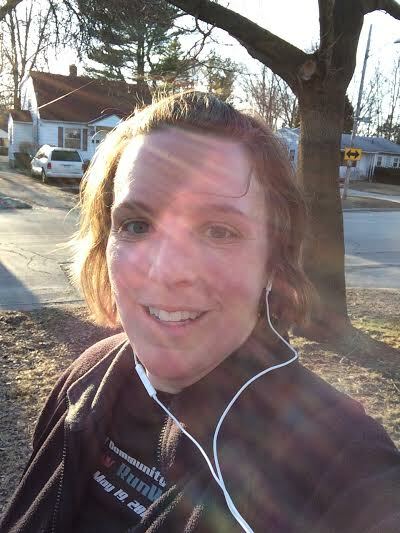 Shelley convinced Lee to start running, and yesterday, Lee completed her first race--a 1-mile race to support the library! 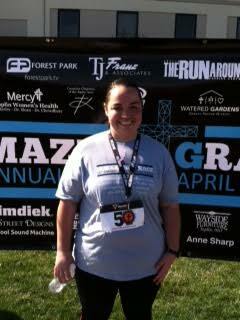 She did great, and has signed up for a 5K in a couple of weeks. 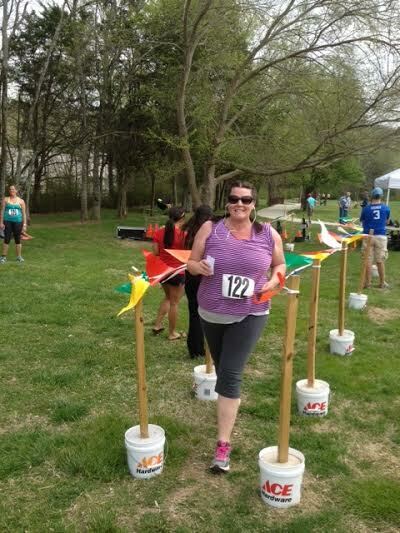 Shelley has dropped over 100 pounds, and is working on her 5K and 10K times! Lesleigh recently stepped WAY out of her comfort zone when she saw that her local running store was asking for people to model some athletic wear in a fashion show. She signed up, but then started to feel self-conscious--she's lost 70 pounds, and was concerned about wearing shorts with some loose skin she has on her legs. Instead of backing out, she talked to the store about it, and they had her wear capris--problem solved! She was super nervous, but it ended up being a great experience. She wanted to show other women that runners come in all shapes and sizes. 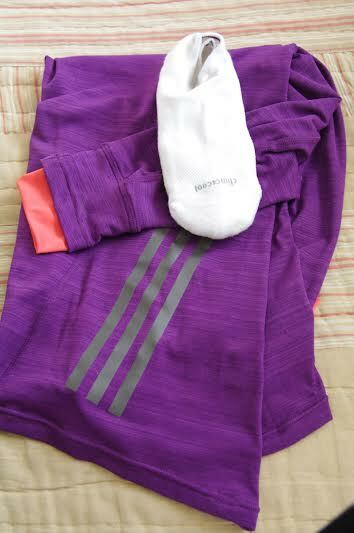 She was given a shirt and socks as a "thank you" gift, too! Does Kristina have a blog? Motivational Monday is my favorite day!! Way to go everybody! These are all great stories! I was just chosen to run the Chicago marathon. 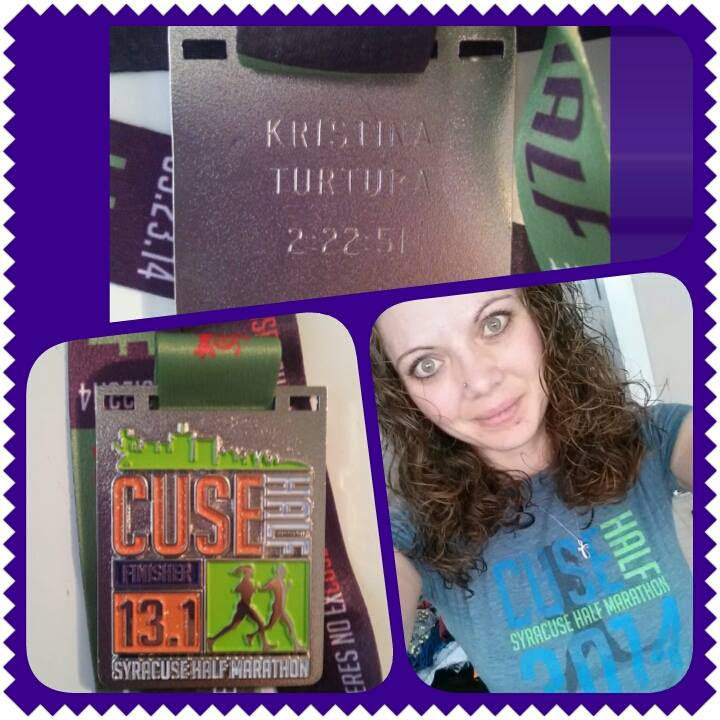 This will be my first full marathon. I've done 3 halfs in the past. Do you have any tips/pointers? Also I'm looking into training plans. What would you recommend? Congrats on getting in! Chicago was a VERY fun race. I've done three marathons with three different training plans, and my favorite (hands-down) is Hansons Marathon Method. I was in the best shape of my life for Chicago! But the plan takes a LOT of time commitment, so if you don't have that, I'd check out Hal Higdon's plans (free online). Whatever plan you go with, just trust the training process! Treat your long runs the same as you would the marathon--using the fuel you plan to use during the race. Way to go everyone! Such inspiration from you all, and full of admiration for you all! So many inspirational stories! One day, I hope to have my own addition for Motivational Monday. Thank you everyone for sharing! I love Motivational Mondays (even tho' I don't get to read them til Tuesday). I hope to be in one of your posts one day. Wow wow wow! Big time congratulations to everyone! What a wonderful Motivational Monday post!